In December 1937, my father, Donald S. Garrett, purchased the South English Herald and published it until he left for the service in World War II in October 1942. 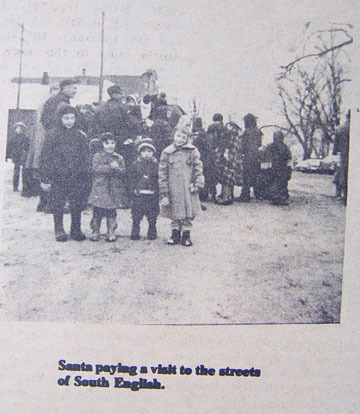 In 1976, he and my mother, Alta, published the Bicentennial Edition of the South English Herald and in 1986 the Supplement to the Bicentennial Edition. ​There aren't many copies around of the original 1976 Edition so I posted some of the articles from the Bicentennial Edition to share some of the history and photos. At the bottom of the page there are links to a scanned pages of the 1976 edition. The first paper published at South English was called the “Advance” and was established by W.W. Yarham, May 1872, the first number being published on the 20th of said month. The paper was run by Mr. Yarham until September, 1872, when it was sold to E.L. Rankin and D.S. Burson, under whose management it was run until June, 1873, when E.L. Rankin disposed of his interest to J.F. Shotts, continuing under the name of Burson & Shotts. In July 1873, Shotts bought Burson’s name and interest and became editor and proprietor, and changed the name to the “Western Herald.” In August, 1873, he sold a half interest to G.J. Brown, the firm then being Shotts & Brown, under whose management the paper was enlarged. Shotts sold his interest to Prof. R. Kieler, in December 1873, the firm then being Brown & Kieler. On the 23rd day of April, 1874, G.J. Brown bought Mr. Kieler’s interest, and became editor and proprietor, and run the paper until April 15, 1875, when he formed a partnership with his brother, Rev. Wm. M. Brown, under the firm name of Brown Brothers, and the business was continued by them until October 19, 1876, when G.J. Brown again became proprietor and continued the publication of the “Western Herald” at South English, until August 18, 1877, when he moved the material to Harper and run it until March 1, 1878, when he sold to the Harper Publishing Company. The paper was published there until September 6, 1878, and discontinued, when G.J. Brown again bought the material back and moved back to South English, and on the 18th day of October, 1878, again commenced its publication. On the 1st of March the office material was sold to J.F. White as proprietor and G.J. Brown editor and publisher. On August 4, 1883, the “Western Herald” changed its name to “South English Herald.” Although complete files of the paper have not been found, copies of 1893 and 1894 were published by T. Leroy Evans. We have information that a Mr. Ives, Dan Evans also were publishers. The last was Doll Young, probably before 1900. 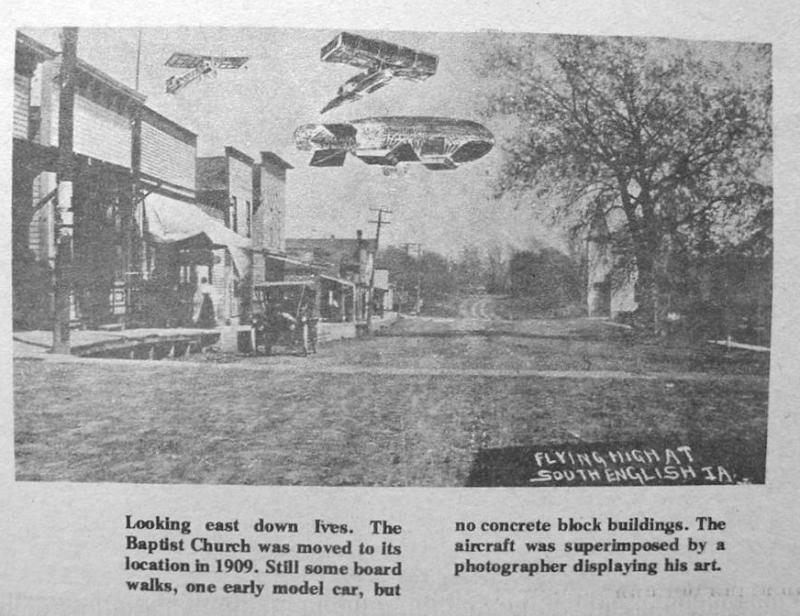 In January of 1935, Ellis Rickey began publishing an 8 1/2 x 14 mimeography paper also called the South English Herald. It was published by Rickey until December 1937 when the paper was sold to Donald S. Garrett. The “Baby” Herald, as Mr. Rickey had called it, was published until 1942, when Garrett entered the service in World War II. The forerunner of White's Store was known as "Old Post's Store", sometimes even referred to as "Post's $10 Store" because of the fact the first load of goods in the store amounted to only $10. It was hauled by James Hennon from Washington. Where "Old Post" went was never known, but the next owners were Adams & Hogin, who later sold to J.F. White and Perry Hennon. The latter later sold his share in the store to J.F. White. J.F. White was born in Boone County, Indiana, June 3, 1835, his father being of English ancestry and his mother of Welsh origin; the former died when he was nine years of age, and the later when he was fourteen. He received a very limited education in the district schools of his native county, supplemented by an attendance at Lebanon, Indiana, Seminary for a short time. At the age of fourteen he commenced teaching and followed it as an occupation for five years. When he was nineteen years of age he improved a farm in Holt county, Missouri, breaking the land himself with a heavy yoke of oxen. In 1857, he decided to change his location so came to Keokuk county, settling in English River township, and engaged in farming. He acquired a farm of 365 acres. In 1858 he bought out Hogin, Adams & Co., dealers in general merchandise and was successful in that business. He probably built the building which was moved to the new town in 1879. The store never closed its doors, as far as business was concerned, during the moving. The moving process was slow and customers went to the store shopping as usual. In connection with his mercantile pursuits he engaged largely and successfully in stock-feeding and stock-dealing; he was a director in the Iowa City & Western Railroad and it was largely owing to his efforts and energy that the northern portion of the county had railroad communications. He was proprietor of the "Western Herald" a journal that had quite a circulation in Keokuk and adjoining counties. The business continued until the early 1930's. 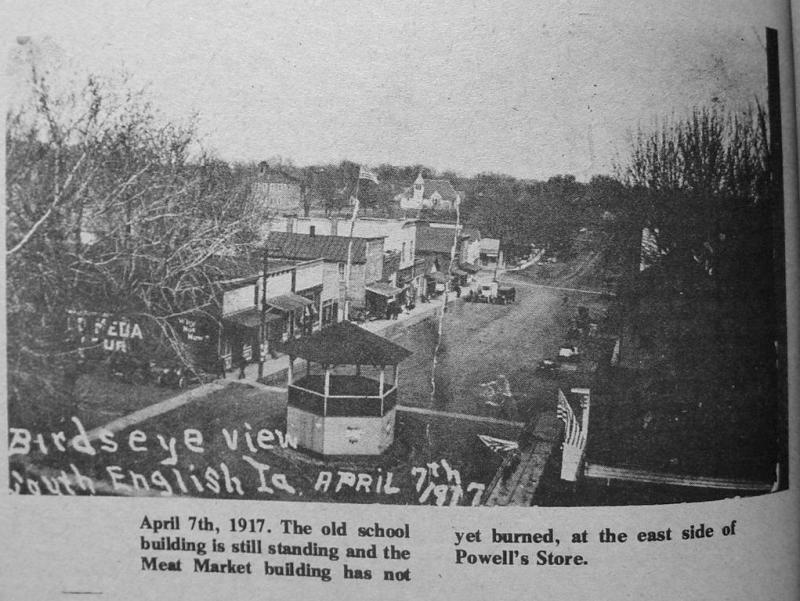 The stock was auctioned off, and the general store was no more. 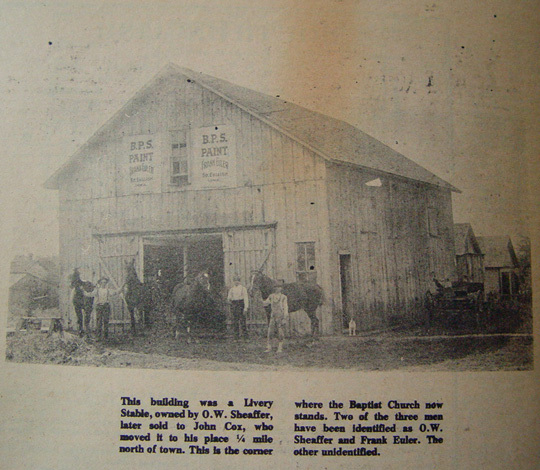 The post office was moved into the building with the grandson of J.F. White as the postmaster. He was also named J.F. White. 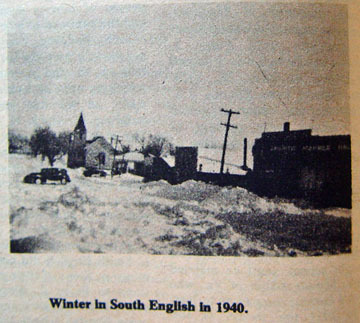 The winter of 1880-81 was fine until about February 15, and then we had a blizzard regularly every Friday, Saturday, and Sunday (three days) for six weeks. 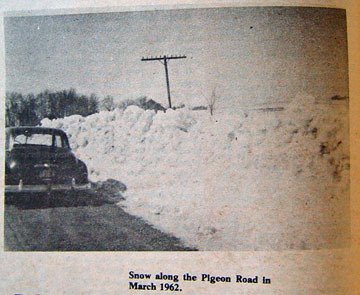 There are not many men now living in Southern Iowa who have seen an old time blizzard where the strong wind from the northwest filled with ice and snow was impossible to face it or see any object, even a house or barn, 20 feet away. Persons have lost their way and perished trying to go to the house or barn and vice versa. But storms of that feature will never come again. The country is too well settled up. Too many groves, buildings and corn fields. In those days there were very few wind breaks from a little ways north of Cedar Rapids to southern Minnesota. When the blizzard blew itself out, the sun would come out the following day and with no wind at all it was really pleasant to be outdoors. Then to open up the road took two to three days with two engines and 30 to 40 men. It was frequently the case that the north and south lines would not be blocked at all but the east and west lines got it bad. I have seen six engines on a four car train trying to break the way. I have known engines to be derailed on hard snow but do not recall anyone ever getting injured. To run into a snow drift was like jumping into a feather bed. There are only a few of the old timers left, but it is always a pleasure to meet them and recall the days when railroading in Iowa was primitive. Talk about hard times. Some of the present day men don’t know the meaning of the word. I have known the section foreman to bury the only emergency rail he had for fear the roadmaster would see it and order it sent to some other section. Sixteen businessmen met last Friday night and organized the South English Commercial Club. This club is not for the businessmen alone but for every one who is interested in making South English a better place to trade and a better place to live. The first action of the club was a telephone call, while the meeting as in session, to Sigourney, with a request to the highway commission to do something about the mud hole folks were getting stuck in as they crossed Highway 22 coming in to town from the north. The next morning highway commission trucks dumped eight truckloads of gravel in the ruts north of the elevator. This gives a straight shoot into town. Action number one for a club not yet organized. H.W. Raplinger was elected president, Don Buchanan – vice-president, and Paul C. Roberts – secretary-treasurer. 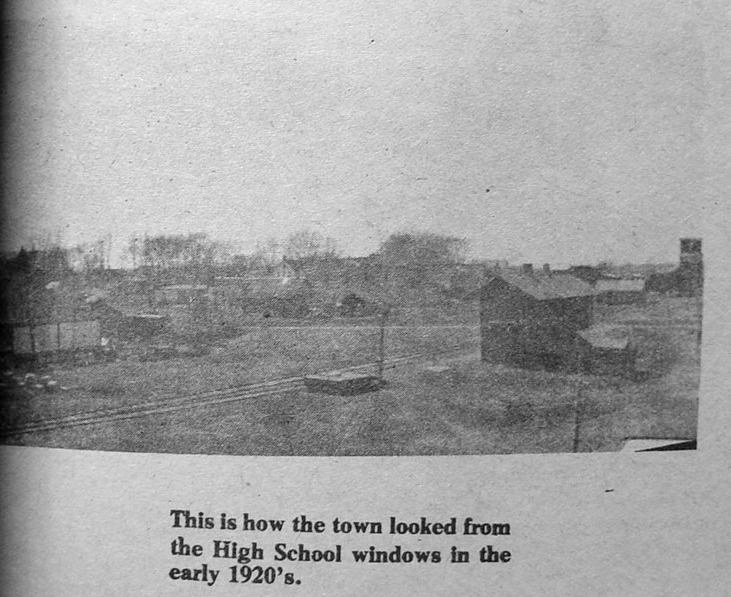 Information from "A Brief History of Keokuk County" by Walter S. Athearn, Principal of Public Schools, Delta, Iowa 1897. First Purchase -- October 21, 1837 a treaty was signed with the Sac and Fox nations which gave to the whites a large tract of land west of the Mississippi river. Nearly all of Richland township and small portions of Clear Creek, Jackson and Lafayette townships were included in this purchase. This part of our country is still called the "Old Strip." Second Purchase -- On the eleventh day of October, 1842, the representatives of the government met in conference with the chiefs of the Sax and Fox Indians, among whom were Keokuk and Wapello, at Agency City, Wapello county. After much discussion, they agreed on a treaty by the provisions of which the whites were given the right to settle on a tract of land comprising the greater portion of Iowa. All of Keokuk county except the portion included in the purchase of 1837, was included in this second purchase. For the land included in this purchase the Indians received $800,000 in state stocks, which drew 5 per cent interest. By the various treaties made with the Sax and Fox Indians, the government paid them $80,000 per year. By the provisions of this treaty the Indians were to be given three years in which to leave the territory. When Keokuk signed the treaty, he remarked that if it was changed by even so much as the scratch of the pen it would not be observed by the Indians. Treaty of 1842 Ratified -- The treaty of 1842 was sent to the senate and that august body, being reminded of Keokuk's remark, ratified the treaty without changing it even by so much as "the scratch of the pen," and on March 23d, 1843, the president of the United States officially announced that the treaty had been ratified. This is said to be the only treaty made with the Indians which was never changed or broken by either party. The New Agreement -- It was finally arranged to have the Indians give possession of all the lands lying east of the Red Rock river in Marion county on May 1, 1843. This then, is the date when Keokuk county was finally thrown open to settlement. In commenting on this treaty and the New Agreement the "History of Keokuk County" says: As a result of this peaceable arrangement and the earnest efforts of the government to carry out, to the letter, the provisions of the treaty, the early settlers of Keokuk county experienced none of the hardships which fell to the lot of the early settlers in the other parts of the country, where misunderstandings about the ownership of the soil gave rise to frightful massacres and bloody wars. The Indians gave no serious difficulty and seldom, if ever, disturbed the early settlers of the county after they had rightfully come into possession of it. In the General election held August 5, 1844, the voters of this area were assigned to the German precinct of Keokuk County, which comprised all area north of Skunk River in townships 75, 76, 77, Range 11 and the east halves of township75, 76, 77, Range 12. In April 1845, the township of English River was organized and comprised all of Liberty, English River and Adams. The three townships seem to have organized individually before 1850. The first settlement was made near the present site of South English by James Mehaffee and Jacob Bowers, in the year 1844. The first family to arrive came in 1845, that of James Thomas, and located on the northwest quarter of section twenty-two. John Houston came that same year and located on section twenty-four, near the present site of South English, and this place was known as Houston's Point. James Chambers and H.H. Rodman settled soon after on section thirty. Thomas Morgan came in 1847. March 27, 1846 -- First white child born in English River township, Martha Rodman, daughter of M.C. and Rebecca Rodman. Billy Houston was the first baby boy born in English River township. The first death was a child of James Thomas. First marriage, Lem Briner to Dinah Houston, June 1852. First double wedding, George Huxford and Maria Rodman, and Peter Parnell and Louisa Trimble. First frame house built in 1852 by S.M. Slate. The lumber was hauled from Washington by wagon. First burial in South English Cemetery: Dorcas (Doscie) Downs, sister of Mrs. Wm. Sloan, 1861. The township officers elected in April, 1852, were Trustees - Joel Slate, H.H. Rodman and James Thomas; Clerk - Henry Fawel; Justice - W.S. Slate. The first school we have any account of was taught by S.M. Glandon in 1851. There were no windows in the room used for the school. The Methodist Episcopal Church was first organized in 1851. The Baptist was organized in 1855. The Christian was organized in 1856. A Union Sunday School was organized in the fall of 1857, by a Baptist preacher from Iowa City, with the following officers: superintendent, Joel Slate; secretary, M. Slate; librarian, S.M. Glandon. It had a library of two hundred volumes. The town of South English was laid out in March, 1855. 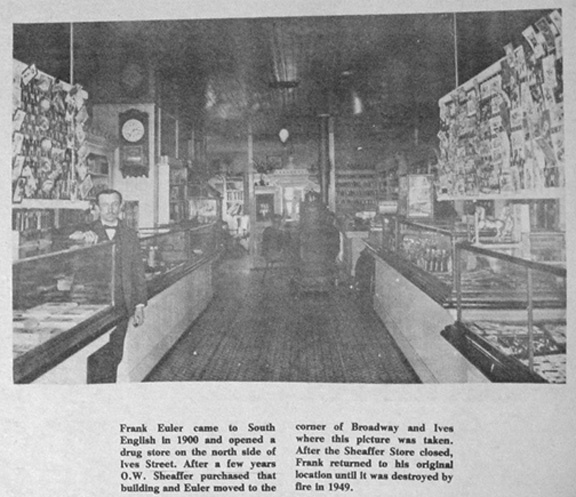 The first store was started shortly after it was laid out, kept by Ethan Post. A South English Business Directory is shown on the plat of the town 1874. We quote the following directory from the 1880 History of Keokuk County: J.F. White, dealer in dry goods, groceries and general merchandise; C.F. Crosby, dealer in groceries; W.T. Coffman & Co., drugs; W.T. Platt, drugs; W.M. 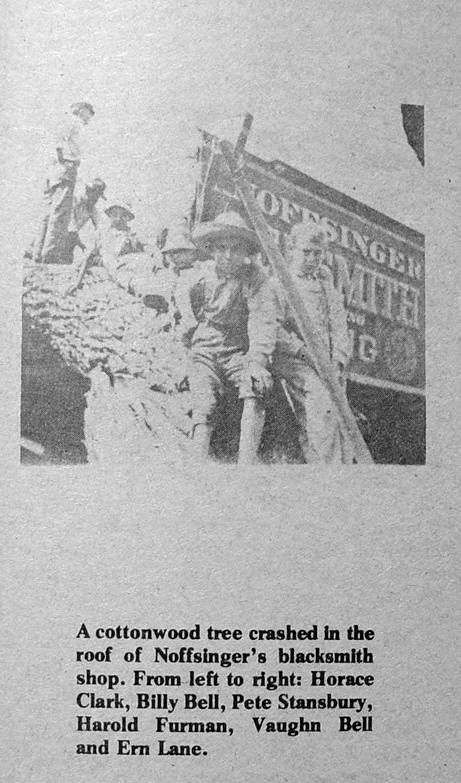 Shepherd, hardware; Geisler & Garlick, lumber; J.F. Mead, blacksmith; J.Q. Lewis, saddlery; N.C. Miller & Son, livery. There is a first-class hotel kept by U. Younkin. The following are the leading physicians: W.W. Newsome, A. Hale and Dr. Cocklin. The Western Herald is a newspaper, J.F. White, proprietor and G.J. Brown editor and publisher. 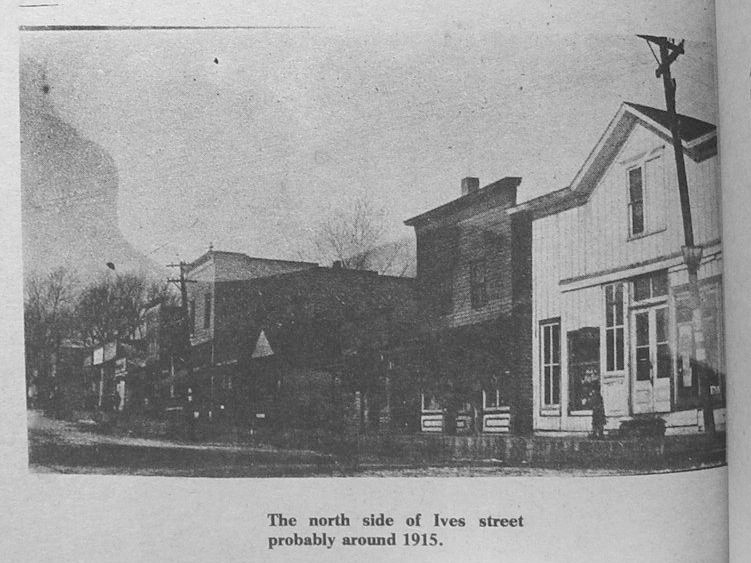 The town of South English was incorporated in 1892. The first election was held on August 22, 1892. Officers elected were: Mayor W.W. White; Recorder, J.W. Newsome; Trustees, Newton Horn, J.M. Black, Wm. Sloan and J.E. Van Aukin. We want and must have a Bank, a Mill, a Jewelry and Music Store, with teacher, and, in fact, this is the finest opening for all kinds of legitimate business. Parties wishing to invest money in buildings for rent would do well, as houses are daily called for, but can’t be supplied. 1820 – Sioux, Fox and Sac Indians camped below Hervey hill on English River. 1844 – James Mehaffee and Jacob Bowers settled in old town. 1845 – James Thomas and John Houstin settled at Houstin’s Point on Heald’s and Mendenhall’s farm. 1846 – First birth – daughter of H.C. and Rebecca Rodman – Mat Hennon Rodman. 1846 – Son of John Houstin born William Houstin. 1846 – Child of James Thomas died. 1847 – Thomas Morgan settled. 1847 – H.C. Morgan froze to death. 1858 – Talley family came from Tennessee. 1851 – M.E. Church organized. 1852 – Mr. Brinor and Miss Diana Houstin married. 1852 – Elected Town Officers: Trustees – Joel Slate, H.H. Rodman, James Thomas. Clerk: Henry Fawel, Justice: W.S. Slate. 1852 – Snow 1 foot deep. 1854 – Mr. Post opened store. 1854 – Town of South English laid out. 1854 – First school house built. 1855 – First Baptist Church built. Samuel West first pastor. 1856 – Christian Church organized. Mr. Matthews pastor. 1857 – Union Sunday School organized. 1858 – First store, Blacksmith, M.E. Church in old town. 1863 – Talley killed, Democrats and Republicans fight. State militia called. Town fortified. 1872 – Frank James kept saloon. 1873 – No. 263 I.O.O.F. organized. 1874 – First Christian Church built. 1879 – Railroad built. Town moved to present site. 1883 – Second school house built. 1888 or 1890 – Park laid out. 1890 – First Bank owned by J.F. White and son. 1893 – South English incorporated. 1906 – J.W. Sloan established monument works. 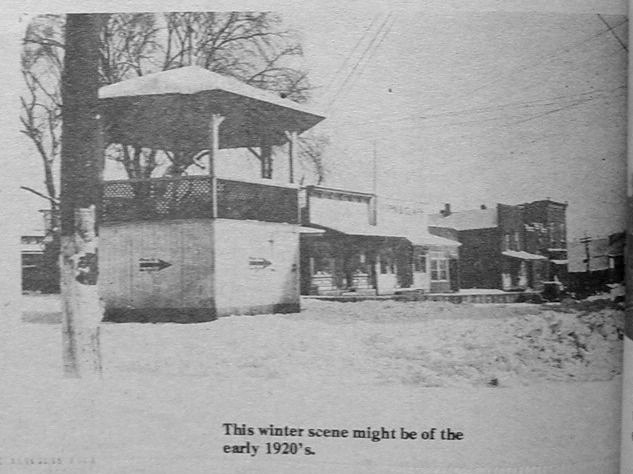 1917 – Town wired for electricity. School house remodeled. 1919 – Electricity turned on. Dr. Allen Heald Sr. had first telephone. John Wenger had first successful automobile. Allen Heald and N.W. Miller were the first doctors. T.E. Matthews was the first preacher. James McAfferty kept first hotel. Frank James gang spent winter here. Folks for miles around came to see the first train come in, came to the “Jubilee” as it was called. On the farm they were getting ready to go to the jubilee, also. These were the palmy days for the farmer. His life was not yet cluttered up with silos, tractors, milking machines, separators, Federal Farm banks, Iowa land booms, bank failures, farm relief, McNary Haugen bills. His wife was up early, too – shoos the flies out, for screens were unknown; browns the coffee in the skillet and grinds it by hand; fries potatoes for breakfast, for Quaker oats and cereals are unknown. It is a cold morning and she lays her husband’s red flannel underwear out – she has “done-up” his shirt herself with tub and washboard and soft soap she had made from the lye dripping from the ash hopper, and the spare grease from butchering. She irons it with a hot handled iron, a hard task, for the shirt opens in the back and the bosom had to be as stiff as a board to shine like polished marble. Her husband puts on his heavy black suit that men wear for Sunday, summer and winter, his Sunday boots, his heavy gold watch chain, combs his long hair, brushes his long whiskers, puts on his stiff hat, takes a chew of plug tobacco, and while he is waiting for his wife, sits down to read what the new editor of “The News” has to say about President Hayes, and the forty-fifth congress. Among the advertisements in “The News” is Schipfer’s special: men’s suits $15 to $20 – now $12.50; men’s overcoats $13.50 – now $5.50; ladies’ muslin nightgown 19 cents; corset covers, trimmed with lace or embroidery 10 cents. Now away go the farmer and his wife to the jubilee in the spring wagon. 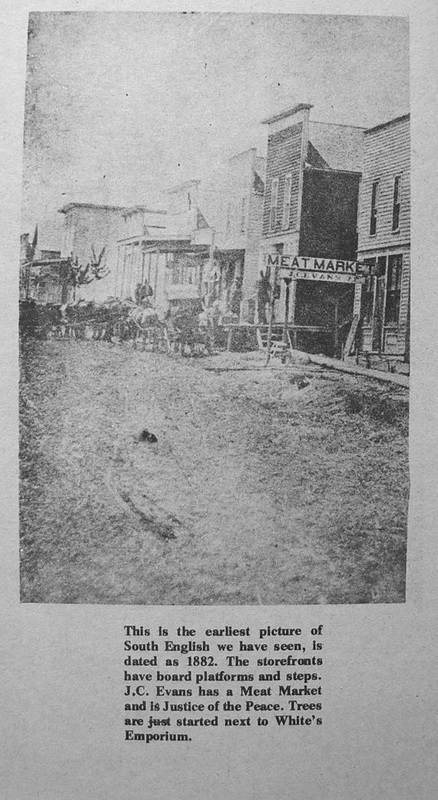 Shafers’ livery stable did a big business that day for it was 30 years before an automobile came to town. 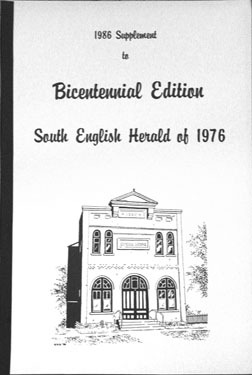 The 1976 Bicentennial Edition of the South English Herald is out of print. PDF files of a scan of the edition are available below. Copies of the 1986 Supplement to the Bicentennial Edition are still available.Email ginzart@gmail.com for more information.